Published: Feb. 21, 2016 at 12:04 p.m. Updated: Feb. 22, 2016 at 09:39 a.m. 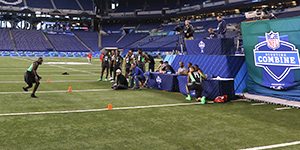 Many, like New England Patriots coach Bill Belichick, bemoan incoming rookies training for specific drills performed at the NFL Scouting Combine -- like the 40-yard-dash. Could those days be coming to an end? Tom Pelissero of USA TODAY repots that National Football Scouting Inc., which runs the combine, is establishing a committee of NFL executives, scouts, coaches, athletic trainers, team physicians, among others, to review all phases of the annual event. "Our first focus is to look at what we do currently and making sure that that's relevant," company president Jeff Foster told USA TODAY Sports. "And if it is, great, we'll continue to do it, because historical comparison is really important to the evaluation process. But if we believe that there's something that's not relevant, then what can we replace it with that will help us evaluate the players?" Tinkering with the combine is something that has been considered more earnestly in recent years. The 2016 NFL Scouting Combine kicks off this week in Indianapolis. Players will participate in the 40-yard dash, bench press, vertical jump, broad jump, 3 cone drill and shuttle run. Routinely criticized as "Underwear Olympics," teams often find more use in the medical examinations and interviews conducted during the Combine than some of the on-field drills. "We're continuing to explore everything in an effort to improve," NFL spokesman Brian McCarthy told Pelissero. "So, if there are ways to tweak, improve, modify anything we do, we'll explore that (and that includes) the combine. The mantra is, how can we get better?" As data becomes more accessible and easier for teams, agents and players to parse, the tenor of the combine could adjust, making workouts more useful and informative. "You can get in on a really granular level and analyze these systems -- even overlays of some of the stuff they do," Dr. Marcus Elliott said. "They measure vertical jump, but there's a lot of ways for two guys to both jump 38 inches. There's potential for this thing to get so much smarter."